I booked my tickets for my return journey from Thrissur to Bangalore sometime towards the end of December 2012. Booking on Kallada G4 was a no-brainer decision since I’ve never travelled ex-Thrissur in Kallada G4. I also used the opportunity to make my first online booking with Kallada G4 – it was the standard TicketSimply experience. At a later stage, the journey looked doubtful due to some official commitments – but I did not lose hope and did not cancel the ticket. It so happened at the last moment that my journey materialised. I confirmed with my contact if I need to take a print out – he said the SMS is enough. I did take a printout for safety though. I had to make a trip to Thrissur in the evening – Private bus strike in Kerala had just commenced that day, but the traffic on the road that day was maddening. We left home around 2020hrs (I was accompanied by Dad and Brother on the trip) – traffic was on the higher side on the road. To add to my woes, it was the church festival at Irinjalakkuda – traffic was chocked around the church. Despite odds, we managed to reach Thrissur around 2120hrs – I rushed to the City Travels (the agent handling Kallada G4 at Thrissur) to find out the whereabouts of my bus. The guy sitting there rudely replied, “how would I know where the bus is? I’ll tell you if it comes”. I was shocked at the guys response – I pulled out the number of my contact, but later decided to see how long it goes. I decided to rest in the car. The clock ticked past slowly – a Sona B9R (to Chennai) came in first. Sometime later, the Parveen Corona to Chennai came, followed by the SRM B9R to Chennai. The time was past 2200hrs. I went back to the office – this time, he said the bus normally comes after 2230hrs. I headed back to the car. Now a Shama B9R came in, followed by a Viji B9R (both are Pathanamthitta-Bangalore buses, handled by the same agent – I feel sorry for the agent). The clock ticked past 2230hrs, and there was no sign of my bus even now. I headed back to the agent – he was now on the phone. He informed the passengers there (booked on the Suresh Kallada bus to Bangalore) that the bus had reached their office at Sakthan nagar. Still no news on my bus. 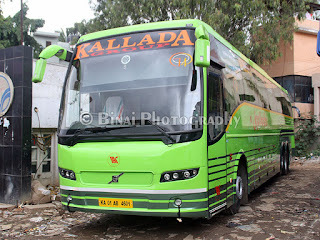 Sometime around 2245, the S.Kallada bus (Alappuzha-Bangalore B9R) turned up – this was KA-01-D-4185, their first Volvo B9R. I was thrilled to see the bus still kept in good shape. Right behind this bus came KL-45-H-6133, their latest B9R. I stood in awe seeing both their oldest and the newest B9R standing together. S.Kallada is one company I admire a lot – despite all their ills and negatives. “Yes,” the driver said. “What is your seat number?” he continued. “That is a friends’ return ticket!” “Which bus did you book?” he asked. “This is the Pathanapuram bus”. I was furious – I had asked this bugger if this was the Kottayam bus before everything started. By now, I noticed another Kallada G4 bus loitering in the background. I rushed to that bus.. I did not make further questions – just ran back to the car, picked up my baggage and rushed back to the bus. I got into the bus. My seat was in towards the back. I reached my seat and found someone already sitting there. I said, “32 is my seat.” He quickly got up and gave my seat. I took my seat and settled down. My co-passenger asked me, “What is the pick-up time at Thrissur?” “Nine-thirty,” I replied. “How is that possible,” he questioned? “The official pick-up time in Ernakulam is only 9pm,” he continued. He said that the bus came in around 9pm there, and there was heavy traffic after that. He had added enough fuel to my fire – I was already furious about the delay. There was a lot of commotion in the bus – quite a lot of double bookings and around three lady passengers were booked near males. The crew and the travel agent where trying to sort out the issue. Now a couple (looked newlywed) got in and claimed their seat. A passenger sitting behind replied, “just go and sit somewhere, the bus is empty”. The guy replied back patiently that he should mind his own business. Thankfully, things did not get ugly. The bus got moving from Thrissur at 2329hrs – a good 1h59m late. I pulled back my seat and decided to retire for the night. My co-passenger consoled, “he’ll reach there by 6.” “He might reach there at 6, but it’s not a great idea to delay pick-up for two hours,” I said and closed my eyes. The guy at the wheels meant business as he sped through the twisty roads towards Shoranur. I slept very soon. I did not realised even when we hit the rough patch at Wadakkanchery. I got up hearing another commotion – the time was 0100hrs, and we were standing at Palakkad. Double booking was the issue again. A passenger (in his fifties) was made to shift his seat because another passenger was booked on the same seat from Palakkad. This person (the person in his fifties) was sleeping then – the crew rudely told him, “You don’t have a seat in this bus. We are adjusting you in the bus. Go to seat 45”. The person was half asleep, so he did not make a scene, and silently moved to the seat. I felt very bad – I had considered G4 to be a good operator. The bus got moving at 0105hrs. I had no hope of making it to Bangalore early in the morning, and I slowly drifted asleep again. I remember seeing the bus stopped somewhere – it was somewhere on the roadside, surely not in a fuel station. I continued sleeping without bothering to check where we were or what time it was. I woke up at around 0600hrs – we were on a four-laned section and there was a KSRTC Airavat Club Class running ahead of us. We pulled into Krishnagiri toll gate shortly – the ACC kept the lead. Both the buses ran neck-to-neck, with the ACC maintaining clear lead. I dozed off for some more time – woke up just when the cleaner shouted out Hosur – none got off (0701hrs). The bus was already an hour and a half past its arrival time at Madiwala! The ACC was still ahead of us. We overtook, rather came parallel to the other bus, at Attibelle toll gate. We surged ahead of the ACC now – that was the Trivandrum-Bangalore Airavat Club Class – it was more or less empty! We stopped past the BETL Toll at 0723 hrs – a couple of passengers got off. Meanwhile the ACC overtook us and went below the flyover. We got on to the flyover, and the driver blasted through the flyover. We finally descended at Silk Board, at 0731 hrs – over a good two hours late. I hurried off the bus and rushed to an auto – did not haggle much on the rate – I desperately needed to reach home, change and rush to office. A while after my auto pulled off, I saw the ACC reaching Silk Board – I just cannot understand the need for paying Rs. 220 for taking the BETL and saving not more than 5~10 minutes! End remarks: This was perhaps my worst experience with Kallada G4 – an operator I consider in high esteem. The bus, KA-01-AB-4601, had about 1.24 lakh kms on the odo. The bus did have occasional rattles emanating from the rear suspension set-up – the maintenance of this bus was not the typical G4 style. This bus happens to be the third B9R of Kallada G4 – and it was also the last bus to have a base colour other than cream/white. Crew behaviour was average – I take strong exception to the event of shifting a passenger in the middle of the night and talking improperly to him. There shouldn’t be a single double booking for any good operator – in this bus we had multiple. The departure time mentioned at Thrissur is a big faux pas – the bus leaves Aluva only at 2040, and they expect it to reach Thrissur (around 50-odd kms away) in 50 minutes, including a dinner break! The bus would ideally turn up only post 2230hrs – and the website should’ve been mentioning this time. The agent at Thrissur was absolutely awful – completely passenger unfriendly. He bossed around as if people were asking for free rations. Kallada G4 is a big no-no for me on the Thrissur-Bangalore route. I’ve been travelling very often with G4 since August 2012 – there hasn’t been a single negative incident from the Bangalore end till date – this single incident leaves the card palace crashing. Will I take this service again: Surely not on the Thrissur-Bangalore route. They are a good operator on the Bangalore-Kerala route, but sorry on the opposite route. Overall an eminently forgettable experience. G4's online tkting was always bad in the beginning-no boarding point,time,agent etc...but I thought this changed after they updated the site....its better not to book online.